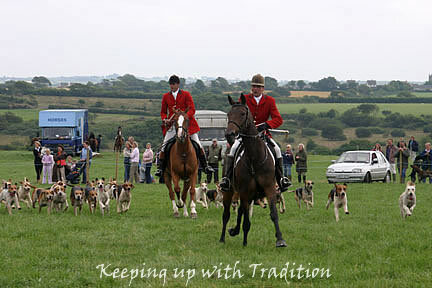 A trip to North Devon would not be complete without a visit to a traditional agricultural show. The first Woolfardisworthy "Colt Show", now the Woolsery Show, was held in 1892 and apart from the war and foot and mouth it has continued to be a draw for locals and visitors. It is now held annually on the last Monday in July. The photos here were taken on a visit to the 2005 Show at Downland Farm, home to the Milky Way Adventure Park on the A39 between Bideford and Clovelly. The hugely successful show on the 25th July attracted a record number of entries with top breeders from across the region. I arrived in the afternoon just in time for the Championship Grand Parade and the very vocal line up included an impressive variety of cattle including the native breed Red Ruby and Continental Breeds. The star of the parade was a massive beast the Valko Champion Belgian Blue. Breeders, cattle, horses, sheep and goats were all immaculately turned out and during the prize giving ceremony all animals were extremely well behaved although some were a little more reluctant to collect their prizes than others. A spectacular Parade of Four Packs of Hounds followed. The bright flashes of scarlet compensated for the lack of sunshine and overcast conditions. 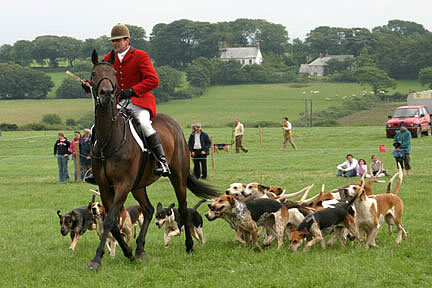 When each individual pack had completed a circuit, huntsmen and hounds joined forces for one last exciting gallop around the ring to a resounding "Tally Ho"! 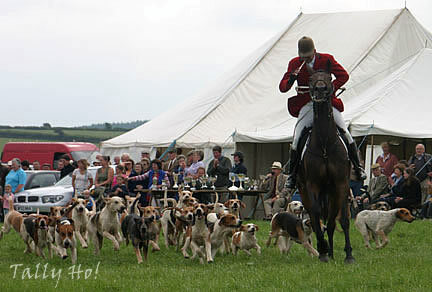 Members of the public were then invited to join the huntsmen in the ring to meet the hounds. The "Mounted Games" were the next event. Three teams, Reds, Blues & Yellows with riders and ponies in all shapes and sizes participated in a number of traditional Pony Club games. Big ones, little ones and tiny ones took it in turns to race, demonstrating the skill, speed and agility of both pony and rider. Each team was cheered on by their own enthusiastic supporters. Meanwhile, away from the main ring, there was plenty to see and do both business and pleasure. Trade stands, exhibition stands, numerous stalls with diverse products on sale and a very popular marquee with free beer available. In the main marquee visitors could taste local produce or buy unique gifts made by local crafts people. Away from the hubbub riders were putting horses through their paces in the Show Jumping ring. Children were kept amused by an assortment of fair-ground rides including a mini Ferris Wheel, Bouncy Castle and what could only be described as a giant "baby bouncer". The organisers of the event are to be congratulated - what a great day out for all the family. In 2008 the show moved to it's current location at Clovelly Court. Don't miss the next Woolsery & District Agricultural Show at Clovelly Court.